EWG scientists reviewed Fallene CoTZ Sensitive Sunscreen, SPF 40 for safety according to the methodology outlined in our Skin Deep Cosmetics Database. We assess the ingredients listed on the labels of personal care products based on data in toxicity and regulatory databases, government and health agency assessments and the open scientific literature. 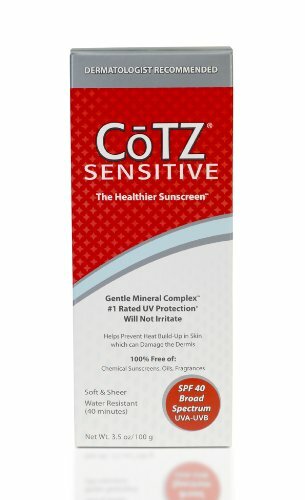 EWG's rating for Fallene CoTZ Sensitive Sunscreen, SPF 40 is 1. Apply generously and uniformly to all exposed skin area before exposure to sunlight. Continue to rub in until fading occurs, especially in hair bearing areas. Reapply as needed and after washing, swimming, towel drying, or sweating for maximum protection. WarningsSun alert: Limiting sun exposure, wearing protective clothing, and using sunscreens may reduce the risks of skin aging, skin cancer, and other harmful effects of the sun. May stain some fabrics. For external use only. Avoid contact with eyes. In case of contact, flush eyes with water thoroughly. Do not use if sensitive to ingredients. Discontinue use if irritation occurs. Consult a doctor or healthcare professional if irritation persists. For use on children less than 6 months of age, consult a doctor. Keep this and all medications out of reach of children. If swallowed, get medical help or contact a Poison Control Center. Sun protection measures: Spending time in the sun increases your risk of skin cancer and early skin aging. To decrease this risk, regularly use a sunscreen with a Broad Spectrum SPF value of 15 or higher and other sun protection measures including: limit time in the sun, especially from 10 a.m. -2 p.m. and wear long-sleeved shirts, pants, hats and sunglasses. Children under 6 months: Ask a doctor. For use on skin only.